Unpredictably, and often fueled by viral posts on social media, an artist’s work can become a trending topic and publicity can soar, at least temporarily. An appealing website layout with professional presentation, intuitive functionality and an easy method of checkout will smooth the way for people who visit your site to begin to learn more about you and your work. 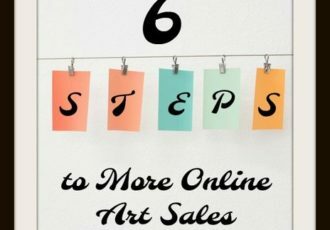 As the social media platform that drives more art sales than any other, Instagram provides an important opportunity to capture followers who are interested in your artwork and keep them informed as to what you’re doing. Keep in mind, while the name “media kit” implies that you will be targeting publications with this material, this is also an effective tool to share with potential buyers, galleries and collectors. You cannot go in several directions at once and put the required time and effort in to become known in that field, gain traction, develop customers and grow sales. With any social media platform, building an audience, providing interesting content, and developing customer loyalty and awareness is the bedrock of future sales. People want and need to see artwork in person. Your online activities support your offline activities.